A professional resume writer has several tricks up his/her sleeve to address potential red flags that might appear on your resume, CV, or LinkedIn profile – these include employment gaps on a resume. An effective resume should always put you in the best light, be honest and accurate, yet grey out areas that might appear to an employer as a “negative” in conveying your unique brand. This includes employment gaps on a resume. Whether it’s a brief period of unemployment between jobs, an extended leave, or other circumstances, they key is to assess whether the gap needs to be addressed, and the best tactic for doing so. Resumes in the United States should not contain any family, marital, or health information. There are different rules for CVs that are used in the UK, EU, Australia and other countries, but in the United States, there is a big value placed on privacy. Also, mentioning these particular issues could bring up legal hiring issues for companies and most companies want to steer clear of any possible problems. If you have a large gap of several years in which you were dealing with these personal issues, consider any volunteer work you were doing at this time. If you were involved with school, church, or a local organization, you can have a section on your resume entitled “Community Service” or “Community Affiliations” and include skills and accomplishments that are transferable to your current career target. For example, if you are in accounting, and helped with a Boy Scout or Girl Scout fundraiser or banking relations for your troop, that would be great to mention. Consider online training, courses, and certifications during this time. You can begin your resume, rather than with your last job from several years ago, with a “Professional Development” section where you can list seminars or courses you took between jobs. Doing this turns a possible negative career gap into an asset that can propel you ahead of other candidates that do not have a particular degree or license. There are an enormous amount of credited, online universities and professional licensing organizations that can keep you current on your industry and increase your authority on a particular subject or skill. Interested in adding coursework and training from top universities like MIT, Harvard, Berkeley, Columbia University to your resume? Check out resources like edX and Coursera for free and low-cost offerings. Everyone has gaps on a resume of some length. If your gaps are a few weeks or a few months, you should not be concerned. Particularly in today’s employment environment, employers know you could be out for several months seeking employment. If your gap is 12 months or more, at that point you might have some explaining to do. One quick fix is to only use years on your resume, not months and years, as most resumes do. Avoid detailing the circumstances of your gap on the resume – but do be prepared to address such questions in the interview process. 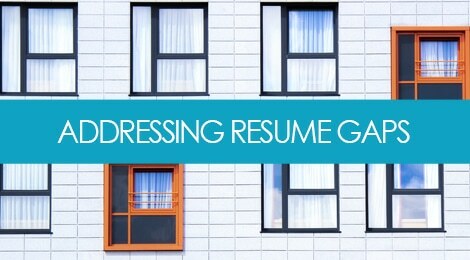 Long Periods of Time Between Relevant Positions – Should You Use a Functional Resume? Today’s employers are looking for a reverse chronological resume format (most current role first, then positions follow from most current to oldest). Functional formats are not recommended unless there is a very unusual circumstance. If you have several roles from a while ago that employers would find ideal, consider starting your resume with a section entitled something like “Relevant Career Experience” and listing these jobs on page one, then have a different section under this entitled “Current Career Experience” or “Additional Career Experience” and listing your most current jobs. Everyone has challenges and highlights throughout their career that may impact the format their resume takes. A professionally created resume reduces the problematic areas while emphasizing your top selling points. Not all gaps on a resume can be removed, covered up, or minimized – but the key is to maintain focus on the most relevant and valuable aspects of your resume, and your personal brand. Tags: career, hr, job search, personal branding, resume. Bookmark the permalink. Should I Work With a Recruiter?